Pastel, metallic, neon, rosé. Whatever suits your fancy, your hair can now be adorned with splashes, melts, peekaboo strands, and all over saturation of beautiful non-conforming hues. Unnatural tones in hair is now one of the most asked for color services in salons. Here are a few things you need to know before taking the plunge. Plan to be in the chair for a minimum of 3 hours for your first appointment. 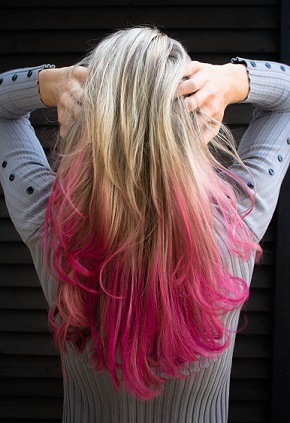 Have color in your hair already? To get pure pigments in their brightest, clearest, truest form, all of that color needs to be taken out. Your hair will need to be cleared and lightened to the appropriate level. Pastels and platinums on your brain? Your hair will need to be lightened to a very pale yellow (basically white). You’re on a journey, your hair may not be to 100% of your desired color in the first visit. It will get better each time. It may take a couple appointments and a lot of reconstructor if you have lots of color in your hair, if your hair is dark or if your hair is fragile. No self respecting stylist will attempt these colors on hair that won’t make it. This may require gradual lightening to keep your hair intact. What good is a beautiful color if its on crunchy, broken, frizzy spaghetti hair? Make no mistake, this process can be drying and damaging to your hair because of this process. Never had a chemical service done to your hair before? Your hair will feel different than it did when it was in its natural state. However, don’t worry, a great stylist will take into account the proper precautions and additional treatments needed to maintain the integrity of your hair. Achieving that beautiful pastel blush is time consuming and a detailed intricate process and takes a lot of time and good quality color and products, assuming you want it professional and well done. The time it takes will reflect the cost of the services. Buy the shampoo your stylist tells you to buy. You just spent hundreds of dollars attaining your dream shade. A salon won’t guarantee the color and won’t do redo’s on a color that you say fell out when you used Pantene or a drugstore-bought professional shampoo (read: black-marketed, expired, tainted). Telling you to use a professional shampoo and conditioner (especially ones for specified colors and tinted ones) isn’t a stylist trying to make a sale. It’s to guarantee that all the work and hours she just put into your hair doesn’t go straight down the drain. When coloring your hair, nothing is ever guaranteed. And that is why your stylist is asking every question under the sun about your hair. Tell them everything they could possibly want to know about your prior hair services or DIY attempts. It’s for your benefit. Fashion colors aren’t always attainable in one salon sitting. It is a process. Corrective colors are priced according to experience and the time it takes to get the job done. This is why we highly suggest a full consultation before you even book your appointment so that your stylist will know exactly what she will be doing and you will know exactly how much you will be paying. But if you guys do decide spacing it out over a few appointments, it’s still exciting to be a whole new shade each round! If you bring pictures, be prepared to explain what it is you like about the hair in the picture and ask for swatches of that shade so you can see it on yourself. Often, thanks to lighting and photoshopping, colors on the models look like universally appealing colors. They’re not. Sometimes no matter how cool that Instagram celebrity looks in a navy to light blue ombre, it might just a little too bright of a color to bring into your 9-5. Or even for your skin tone. Or your style. Sometimes it helps to find a picture of hair that you love and put your thumb or hand over the rest of them so you’re just looking at the hair. That way you can see just the hair, not the whole look. Also. Believe us when we say it’s a wig or it’s photoshopped. It’s not that we don’t want to do that super awesome color, it’s just not a realistic expectation. What will it take to keep your locks looking fresh? Frequent re-applications of color. Pure pigments don’t last in the hair due to the nature of the molecules. You may be looking at every 4 weeks give or take depending on the color. You may not necessarily need to re-lighten every time - unless you’re planning to be bright/pastel roots to ends. Swim? Wash often? Maybe even less time. As your hair grows in, it will eventually need to be re-lightened and colored accordingly - maybe every 8ish weeks. Stylists love to perform fun, out of the ordinary services. We have a creative brain, it gives us energy and makes us happy when you are happy. We just want you to know what it takes and be 100% sure that you’re willing to take the plunge. We only want the best experiences for our guests so we want you to have all the information you need to make a great choice for yourself. Don’t want to take on the commitment? No worries, we’ll find something else cool for you to do with your hair. Posted on October 3, 2018 by Anna Walsh.